Wilson Kipketer’s 800m old mark of almost 13 years has finally been broken by Kenyan David Rudisha. The new record now stands at 1:41.09, eclipsing the old timing of 1:41.11 by two hundredth of a second. The 21-year-old ran a superb race in Berlin, Germany, during the ISTAF meeting. A blistering first lap that sets a world record pace in motion, and ended with yet another punishing second lap which surpassed the old mark. 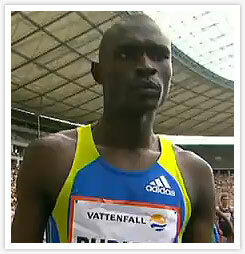 The signs were all there I reckon this season, as David Rudisha came close last July running 1:41.51 in Belgium. And before that 1:42.04 at the Bislett Games in June. All he needed was the quality competitive races under his belt to lower his times. Rudisha was quoted stating the race in Berlin was his “first real attempt” at breaking Kipketer record, and assured the media more is expected to come. Does this mean we’ll be seeing a first ever sub 1:41 timing in the men’s 800m. Well that sure would be a delightful to watch.